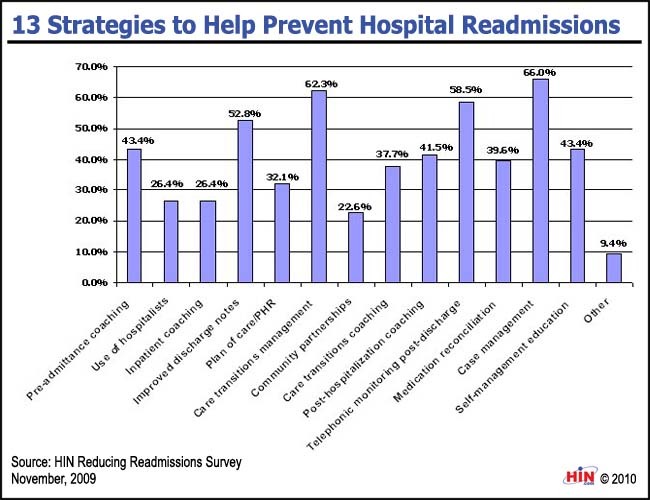 2010 Benchmarks in Reducing Hospital Readmissions provides actionable information from 107 healthcare organizations on their efforts to reduce avoidable readmissions in their most vulnerable and highest-utilization populations. This 50-page resource provides metrics and measures on current and planned initiatives as well as lessons learned and results from early adopters of readmission reduction strategies. 2010 Benchmarks in Reducing Hospital Readmissions is available from the Healthcare Intelligence Network for $139 by visiting our Online Bookstore or by calling toll-free (888) 446-3530.